Adolph Zukor was a pioneer in motion pictures on almost every level. Widely credited with founding Paramount Pictures, Zukor gained control of "Paramount" when it was a fledgling distribution company, building it over the years into an extensive media empire. Born to a Jewish family in what was then Austria-Hungary, Zukor left for America at the age of 16. First working in an upholstery shop in New York, a friend got him a spot as apprentice to a furrier, where he remained for two years, becoming a skillful designer. He eventually opened his own shop, Zukor's Novelty Fur Company, expanding to a payroll of 25 workers, and opening a second branch. You can see the pattern emerge already. Doing very well now, a cousin asked Zukor for a loan to help open a penny arcade, which would feature Edison's Kinetograph. Zukor accepted the offer, but insisted on becoming a partner, also pulling Marcus Lowe into the venture. Before long, this holding company controlled many Nickleodeons on the East Coast. Thinking that he could make films, Zukor set up Famous Players Film Company in 1912 in order to import longer European films, like Sarah Bernhardt's Les Amours de le reine Élisabeth (calling it Queen Elizabeth) releasing the 40 minute film in the U.S. on a states rights basis. Setting up partnerships with the Frohman Brothers brought many Broadway talents before Zukor's cameras in a studio he created in the Chelsea section of Manhattan. By 1914, Famous Players was having its productions distributed by a two-year-old outfit called Paramount Pictures, founded by former Utah theatre owner William Wadsworth Hodkinson. Under Hodkinson, Paramount had become the first national distributor of films, including those being made by former theatrical producer Jesse L. Lasky's Lasky Feature Play Company. Since Zukor's Famous Players and Lasky's company were doing the same thing — making longer films, Zukor decided to merge the two, calling the new entity Famous Players-Lasky Corporation in 1916. At the same time, the new company bought control of Paramount, eventually ousting Hodkinson. Lasky and his partner, Cecil B. DeMille, concentrated on production. Paramount soon came to dominate the movie business. Zukor's next maneuver became building a stable of stars, which included Mary Pickford, Douglas Fairbanks, Gloria Swanson, Rudolph Valentino, Clara Bow and Wallace Reid. Next came block booking, where Paramount required theatre owners to book the entire Paramount schedule of films in order to get the hits, rather than just ordering the hits. Some theatre owners fought this by pooling their assets together and began successfully producing films through their First-National studio. These theatre owners boycotted Paramount product. In 1918, Zukor bought the former 300-acre estate of Lawrence Abraham in New City, New York. Calling it the Mountain View Farm, he expanded its amenities considerably, adding another 500 acres, and building an 18-hole golf course, which opened to the public in 1920. During the 1920s Zukor oversaw the expansion of Paramount's operations, building huge studio facilities in both Astoria, New York and Hollywood, California. Zukor fought with the Federal Trade Commision over block booking througout the decade. In order to fight the boycott of the First-National owning theatres, Zukor began buying theatres in all the major markets, first in New England, then the south, then used dummy buyers to purchase some of the First-National theatres. He purchased the Balaban and Katz theatres in Chicago in 1926. Paramount's Publix Theatre Corporation became the largest chain of movie theatres in the world, culminating with the New York Paramount on Times Square in New York. Paramount also acquired a 50 percent stake (!) in the Columbia Broadcasting System (CBS) in 1928. The coming of sound brought several challenges for Paramount Publix, but with the onset of the depression, movie-going had stalled by 1932. Now with stockholders to account to, Zukor blamed the red ink on Jesse Lasky, who was forced out. Bankers were called in to straighten things out, but made a mess of things. The theatre chain went bankrupt in 1935. Theatreman Barney Balaban became president of Paramount in 1936; together with Zukor as chairman of the board, they brought Paramount back into profitability. Zukor, no longer able to afford his Mountain View Farm, turned the place into a country club in 1936. He relinquished the property in 1948. 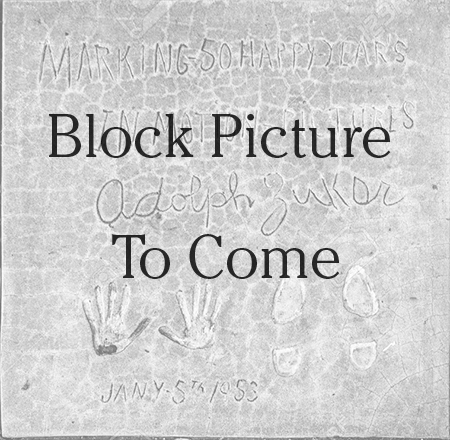 Zukor placed his footprint in the Forecourt two days before his 79th birthday as a PR tie-in to the publication of his autobiography, The Public is Never Wrong: My 50 Years in the Picture Industry later in 1953. 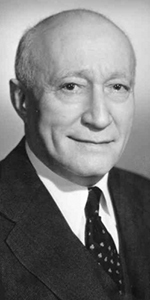 Zukor was elevated to the post of honorary chairman, retired from the comapny in 1959, taking the title of chairman emeritus, a title he held until his death at the age of 103. Grauman's Chinese Theatre, Hollywood, California. Adolph Zukor Forecort ceremony, Monday, January 7, 1953. 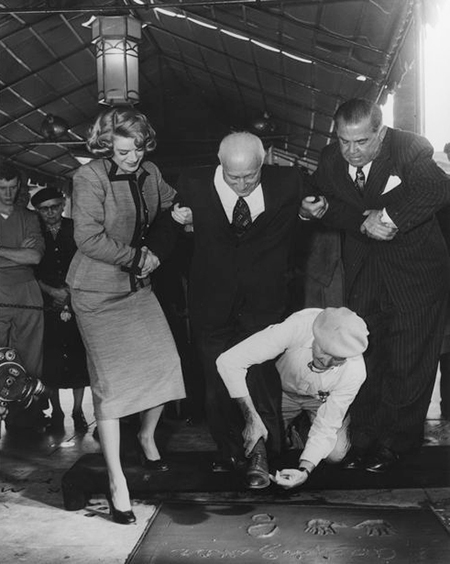 Singer Rosemary Clooney helps steady Adolph Zukor, along with Charles Skouras, president of Fox West Coast Theatres, as cement artist Jean Klossner wipes cement from Zukor's shoe.